Crossbody bags are my favorite at the moment. They are actually pretty perfect. Having the perfect size to fit everything you need in them so you don’t have to carry unnecessary stuff in your bag. They can be worn during the day or night with sneakers, slip-ons or even more dressy shoes. One of my favorite ways to style these is with a sweater and jeans when it’s chilly out. 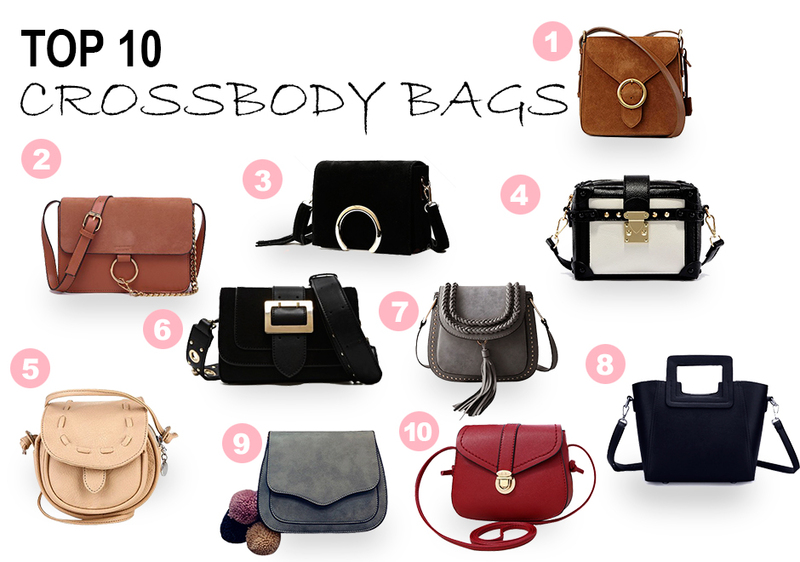 Here are my top 10 favorite crossbody bags from Rosegal. OK, I need #4 immediately!! It’s so cute and chic! I am huge fan of cross body bags! Can’t live without mine. Great bags. Crossbody bags are cute and so easy to carry around. My favorites were the Retro Metal and Tassels Design and the Concise push lock and solid color. Such a great round up of crossbodies! Love it. Love all these bags! SO pretty! Thanks for sharing! Nice collection of bags, I like no. 1 and 2 the most, they remind me of Chloe Faye. Love them all! Such great picks, babe! Great picks! I love the Chloe Hudson inspired bag! I’m loving cross body bags too. Your selection is fab. I’m loving cross body bags as well. So perfect for traveling, especially now in winter where you can simply tuck your hands in your pockets and not having to carry a bag. absolutely in love with no. 7 – that greyish cool tassels bag! Lovely collection of crossbody bags! Great selection of crossover bags. I love all your picks, especially number six! I love cross body bags! They’re my favorite. I love the black and white one. Great picks girl! Stunning bags! I love number 2! Love #2 and #5… they are all so cute tho! Tough decisions! All great picks! I love cross body bags and I love #1, 8 & 10. This is such a good post! I have been on the hunt for a really good cross body bag but I also struggle with wanting to put my entire home in my bag. #8 and #9 are hands down my favs!